HaMakhtesh HaGadol (Hebrew: הַמַּכְתֵּשׁ הַגָּדוֹל‎, lit. The Big Crater) is a makhtesh, a geological erosional landform of Israel's Negev desert. It measures 5 x 10 km. A makhtesh has steep walls of resistant rock surrounding a deep closed valley. One of five makhteshim in Israel and seven in the world, HaMakhtesh HaGadol is the second largest, being exceptional in that it is drained by one river, Nahal Hatira. 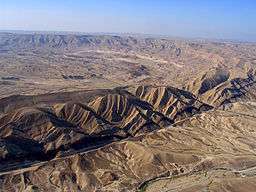 Makatesh Gadol was discovered and named before Makhtesh Ramon which is the largest Makhtesh in Israel. HaMakhtesh HaGadol is near Yeruham, Israel's first development town, established in the early days of the state. The location was chosen because the region was thought to be rich in natural resources. ↑ Livni, Shimshon (1994). Gardus, Yehuda; Shmuel, Avshalom, eds. 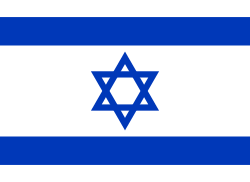 The Land of the Negev (English title) (in Hebrew). Ministry of Defense Publishing. p. 588.